Actuator modules of humanoid robots have relatively higher joint elasticity than those of industrial robots. Such joint elasticity could lead to negative effects on both the tracking performance and stability for walking. Especially, unstable contact between the foot and ground caused by joint elasticity is a critical problem, as it decreases the stability of position-controlled humanoid robots. To address this problem, this paper introduces a novel control scheme for position-controlled humanoid robots by which we can obtain not only enhance compliance capability for unknown contact but also suppress the vibration caused by joint elasticity. To estimate the disturbance caused by external forces and modeling errors between the actual system and nominal system, a disturbance observer based estimator is designed at each joint. Furthermore, a linear feedback controller for the flexible joint model and a gravity compensator is considered to reduce vibration and deflection due to the joint elasticity. 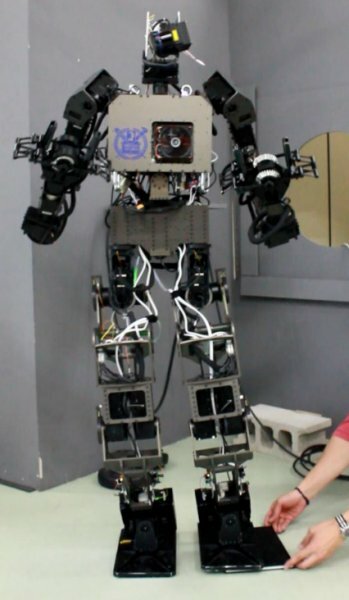 The proposed control scheme was implemented on our humanoid robot, DYROS-JET, and its performance was demonstrated by improved stability during dynamic walking and stepping on objects. This paper presents a control method for compliant motion and vibration suppression of humanoid robot with flexible joints. The control consists of three parts: the DOB based estimator for external force, the linear quadratic regulator (LQR) based trajectory tracking controller, and the gravity compensator. The performance was demonstrated by improved stability during dynamic walking and stepping on unexpected objects.